You are at:Home»Cruise Tips»What On-Board Extras do I have to Pay on a Cruise? What On-Board Extras do I have to Pay on a Cruise? Whilst it is possible to book an all-inclusive cruise holiday and have a fantastic time without spending an extra cent, many ships offer a range of paid extras. Here are ten extras commonly found at additional charge aboard the biggest and brightest cruise ships. Whilst the majority of the cruise ships will offer a wide selection of complimentary eateries; paid-for restaurants offer additional dining options at a cost. Royal Caribbean in particular are paying attention to increasing the dining options available aboard their ships, offering up to 10 complimentary eateries per liner. This makes it easy to find something to suit the whole family without having to pay extra. Many cruise companies are making a concerted effort to improve their on-board internet facilities and speeds to help keep passengers happy and connected to the world back on shore. However, all cruise lines charge for use of WiFi and traditional internet connectivity whether you are using the on-board internet café or your own mobile device. The majority of vessels allow you to buy per-minute packages, granting you access to the World Wide Web. The vast majority of cruise liners offer comprehensive complimentary on-board gym and exercise facilities for all passengers. However, spa treatments often come at an additional cost, depending upon the liner and the particular treatment. Cruise ships are putting increasing emphasis on spa treatments, so this additional cost could certainly be worth it. More sophisticated and family cruises do not subscribe to the booze cruise philosophy of ‘pay once and get loaded’. Alcoholic beverages will come at an additional cost as will speciality soft drinks and speciality coffees. 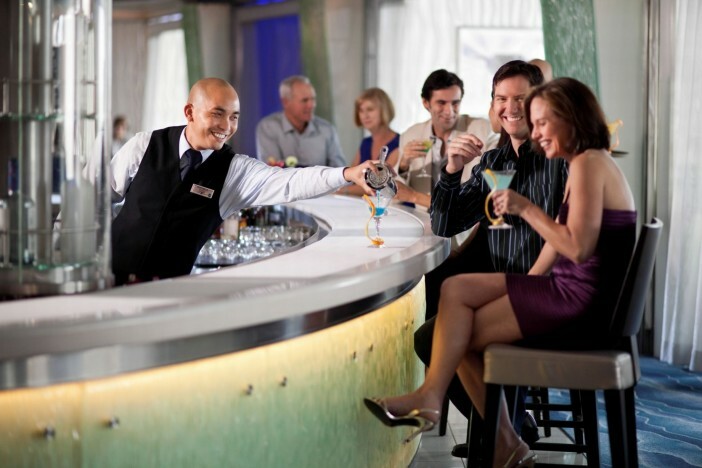 However, the majority of ships offer happy hours for passengers wanting to get more booze for their buck. The crew aboard luxury cruise ships go above and beyond to ensure your holiday is as enjoyable and relaxing as possible and many liners remunerate them with a standard service charge added to the costs of the cabin per night. It is worth checking with guest services how much this per-night tip will come to, so you have no surprises at the end of the holiday. This amount can be increased or decreased at your discretion, depending on the service you feel you have received. Although the vast majority of on-board activities are complimentary, including the exciting new P&O Edge, some of the more specialist activities such as wine-tasting, yoga and behind-the-scenes tours will cost extra. Babysitting and childcare services often come at an additional cost for parents and guardians. Unfortunately an all-inclusive cruise is not akin to a game of Supermarket Sweep, wherein you can dash around the shops plucking anything and everything from the shelves without cost. Any souvenirs or little treats for yourself will come at a cost. Getting your photograph taken by a professional on-board photographer can easily cost $20, but these are entirely optional. For those looking to save a little cash, simply take your own photographs or befriending fellow passengers and asking them to snap away. Some ships provide laundry services for passengers at an additional cost. Before handing over a bag of dirties to be washed, make sure you check the pricing principles on the ship. A simple solution is packing sufficient clothing for the duration of the trip, and wearing a bib if you’re a particularly messy eater. When the ships dock in port, cruise lines will offer a number of excursions for passengers to take guided tours of their destination. However, these will come at additional cost which may be beaten in price if booked well in advance or through local operators. For a full range of Cruise1st packages, visit our homepage or call our dedicated sales team on 1300 857 345. Image Sourced Via Celebrity Cruises, Amazon Web Services and MSC Cruises Media Center. Credit: Celebrity Cruises, MSC Cruises (USA) and Amazon.